Every job starts with the file and the RIP, and every printer wants both consistency and productivity whether they are sending jobs to a proofer or to a platesetter – or both. As printer technology becomes more sophisticated, so do the choices. Mitsubishi Imaging provides support for various printers, beginning with support for older proofing technology to the latest vDot4 series of proofing plug-ins for the newest printers available from Epson, such as the Epson 7900 and 9900. Proofer plug-ins are available to Diamond Jet RIPit RIP users, SDP RIP users and RIPMate users. Click here to contact us for upgrade information and assistance. 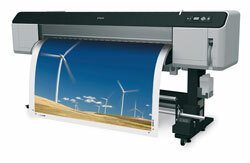 Epson Stylus Photo 2100, 2200, 2400, 7600, 9600, 10000, 10600, 4800, 7800, 9800, 4880,7880 and 9880. With every printer we support, Mitsubishi can also provide an ICC Profile for all the proofing media we recommend for each device. Using industry standard software each profile has been generated and tested in-house to provide ultimate quality output. By creating a base calibration, ink limit tables and ink conversions, we can provide the best results for each printer.